One of the things I love about the weather getting warmer, is the abundance of fresh, delicious fruits. Over the winter months, we miss being able to have fresh fruit on a daily basis. My two children know that they can eat fresh fruit or veggies at any time, no need to ask! I've tried a variety of dried fruits in the past, and it can be difficult to get them just right. Bella Viva Orchards provides the most delicious mixed dried fruit that I've tried in a very long time. 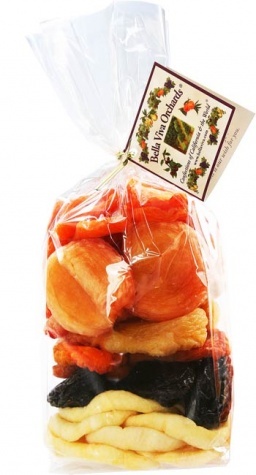 Their mixed dried fruit variety includes plump apricots, peaches, plums, pears, apples, and nectarines. Simply put... they were both delicious and mouth-watering! When you think of dried fruit, you might assume that these will be crunchy... but that isn't the case at all. These dried fruits were moist and plump. Perfect alone, for baking, in trail mix or on ice cream! Bursting with flavor, absolute perfection! They are also a very healthy snack and high in fiber. My children devoured them and asked for more! Now through July 20th, Bella Viva Orchards is offering my readers a 15% discount on all online orders. Simple use coupon code blogdiscount2x720 at checkout! This giveaway will end May 27th at Midnight EST. I love dried cranberries and I would love to try the fruit and nut trail mix! I want to try the Chocolate Walnuts. i would love to try the california organics gift basket 11 lb! Chocolate Covered Grapes, 8 oz. Would love to win! Especially the dark chocolate covered cherries. Thanks for the chance! Love dried fruit, especially apricpots.